The Haldimand-Norfolk Health Unit offers food handler certification courses and exams in Haldimand and Norfolk counties to help promote safe food handling within the food service industry. Food poisoning can seriously damage the reputation of your establishment and directly affect your business. Learning and adapting the skills taught in this course will help protect your business and the health of your customers. This full-day course is designed to help familiarize staff with safe food handling practices and skills that ensure food is stored, prepared, and served in a manner that is in compliance with the Food Premises Regulation under the Health Protection and Promotion Act. At the end of the course, participants will write a food safety certification exam. Those individuals who successfully pass the exam will receive a Food Handler Certificate from the Haldimand-Norfolk Health Unit that is valid for five years. This certificate is recognized by the Ontario Ministry of Health and Long Term Care and other Health Units in Ontario. Those who wish to study on their own time may challenge the Health Unit food safety certification exam without taking the full-day course. See below for a list of ‘exam only’ dates and locations. 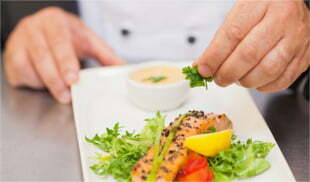 Two online food handler courses are also available at www.ingoodhands.ca or www.foodsafetytraining.ca. When completing either course you will complete the exam online using a webcam. Click here to view a Ministry of Health and Long Term Care (MOHLTC) list of food handler training programs deemed to be equivalent to the training and certification offered by local public health units as an alternative option. Submission of completed form and payment made in-person will reserve your spot in the chosen course/exam. Cheques are to be made payable to ‘Norfolk County’. Please do not mail or email registration forms and/or payment due to limited spots available. Please note we do not accept credit cards. Registration fees are non-refundable one week prior to the course/exam. IMPORTANT: Please bring proof of Government issued identification with you to the exam. For more information, contact the Haldimand-Norfolk Health Unit at 519-426-6170 Ext. 3231 or 905-318-6623 Ext. 3231 or email environmentalhealth@hnhss.ca.